Many data modes used in radio transmission can be simulated by the sound card. This includes packet, pactor, PSK31, slow scan TV, teletype and even morse code and there are more. This interface unit was developed to bring the best of advantages for this function. It is supplied as a kit of parts which the purchaser constructs to the completed unit in about 1 ¼ hours. It has a printed circuit board onto which all the components are installed. Then the board is snapped into the pre-drilled plastic case. 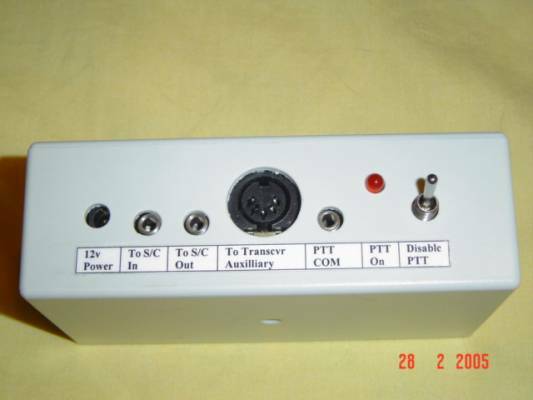 Since many recent computers do not have COM ports, this interface has a sound detector circuit to generate the push to talk signal for a transceiver but a choice is also given to employ the signal from the COM port of the computer for PTT generation. When used this way, the COM port lead is isolated by an opto coupler. Some operating methods require disabling of the PTT line to avoid bogus transmissions. A switch is provided to perform this. Any hum loop between computer and transceiver is stopped by using audio coupling transformers. Potentiometers are used in both directions to set an adequate level for transceiver input and microphone input. Another feature is amplification of the output from the transceiver to reach a suitable signal level for the line in of the sound card. Many receivers produce an output of only 30mV audio from their rear socket line out. If the sound card microphone input is not being used, this interface can be made to amplify the level with a gain of 8. To access all the features of the interface, a dc supply of around 12 volts of transceiver supply is required but this can be forgone in certain operating modes. Cables and plugs are necessary to connect audio and push to talk signal between the interface and computer, radio. Between computer soundcard and interface, 3.5 mm stereo plugs are used plus a 9 pin D plug on the COM port. Between the radio and interface, a 180 degree 5 pin DIN plug is used. On the other side, different transceivers have their own special accessories plug and / or socket connections. 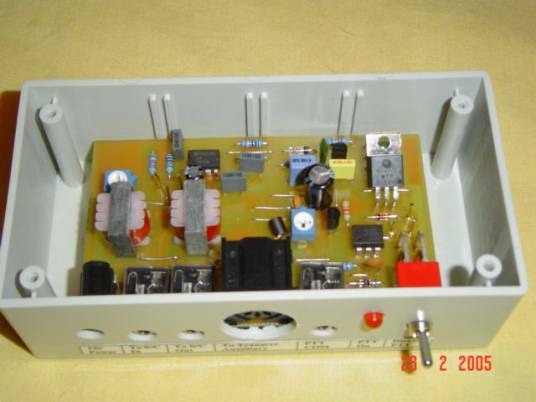 A plug is also provided for the 12v DC supply for the interface. The purchaser may prefer to obtain their own cables but since these amount to a sizeable procurement, the parts to make the cables (minus the transceiver plug) can be provided and included at a reasonable cost price of A$18 if requested. There are varied tailor made requirements in these connecting cables. Some scope here is presented (with some price adjustment) to state your requirements of length between computer and interface as well as interface and radio. You may send any question or request to order the kit of parts by clicking on to the following email link. You can also write to PO Box 2224 Chermside Centre 4032. You can also phone Richard VK4ZA on (07)33765231.